If you’re even remotely considering buying a new piano, I defy you to find anyone better to deal with than Ben Wheeler! His enthusiasm, passion, expertise, professionalism, pride and love for all things piano is second to none, and is quite infectious. From my first phone call to him, through to final delivery, Ben was determined that I should find exactly the right piano for my needs. He dealt with every query very patiently, and kept me in touch with the journey of my piano from the maker in Germany, right to my sitting room. This included sending me photos of my lovely piano being unwrapped in his showroom. 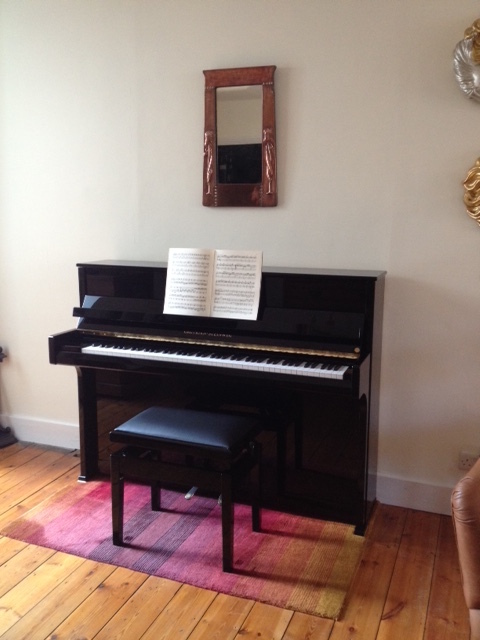 I am absolutely thrilled with my new Gotrian-Steinweg Cristal piano, it (she!) has added a wonderful new dimension to my life. She is the perfect piano for me – sensitive, and with a rich quality you’d expect from a much more expensive piano. It’s impossible to walk past her without playing a note, or just gazing at her! A word of praise for Ben’s delivery team who arrived exactly when they said they would, and were good humoured and very professional throughout – thanks Neil! Ben was recommended to me by a friend, and I am now delighted to pass on my wholehearted recommendation to any potential customers out there!